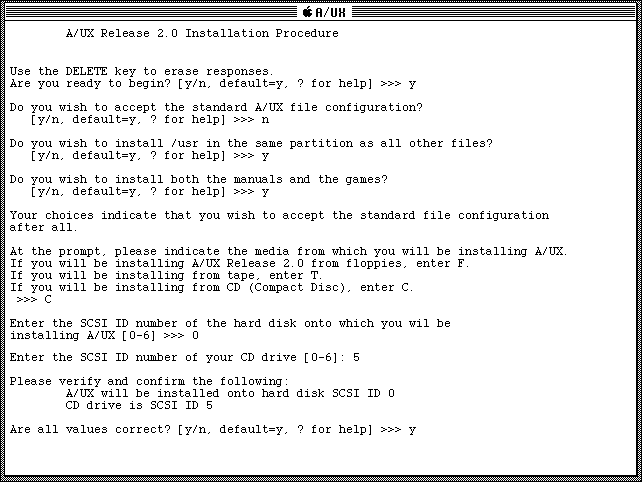 Before attempting this procedure, you should verify that your hardware is compatible with A/UX 2.0 - A/UX bypasses the Macintosh Toolbox, and communicates directly with the hardware, so if your Mac is not on the compatibility list, you're out of luck. This also rules out any of the current Macintosh emulators - Unless your emulator accurately replicates the low-level functions of the PMMU, FPU, and SWIM chips, it will not work. Before we proceed, I assume you have the A/UX 2.0 installation CD, and the setup floppies. If not, please check out the "software" section first. 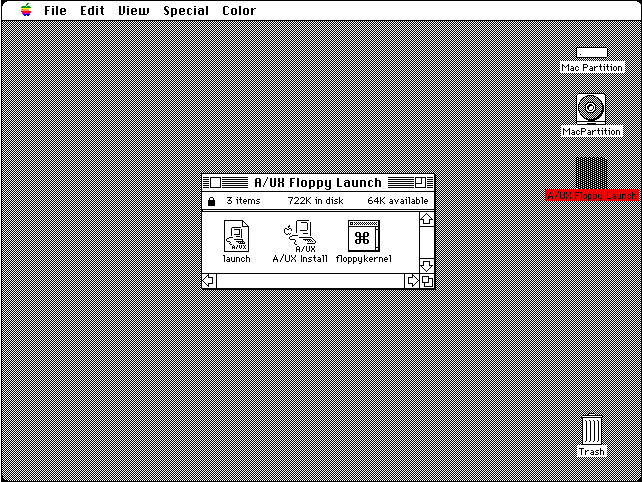 The floppies are 800KB Disk Copy 6.3.3 format, and must be written on a Macintosh. If you don't have any 800KB floppies, you can convert 1.4MB disks by covering the HD indicator hole with masking tape. The classic Macintosh cannot boot directly into Unix - It boots to Mac OS first, then uses an A/UX Startup utility to kickstart into Unix. After installing Mac OS 6.0.7, copy the "cd-rom hack" extension from the A/UX 2.0 Tools disk - drop this in the System Folder, and reboot. Now you should have a fully functional Macintosh System 6 with cd-rom support. 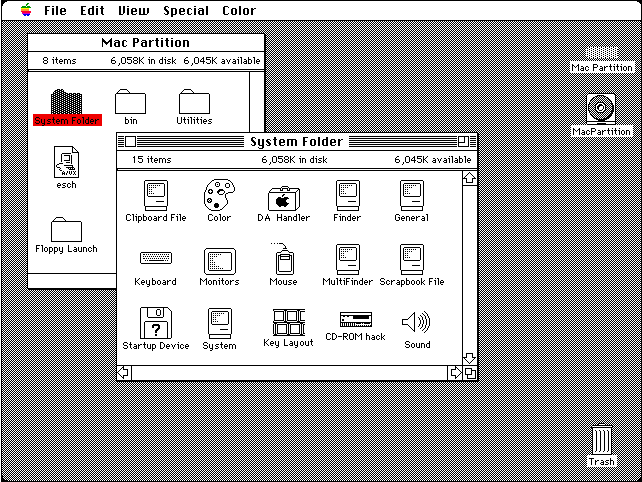 Copy the contents of the "Startup" and "Startup Utilities" floppies to the Mac partition - You will use these later on to boot into A/UX. Now would be a good time to note the SCSI ID of your hard drive and cd-rom... You will need this info shortly. Once you boot back to MacOS, double-click the "Read_Disk" utility and insert the "Kernel Archive" floppy. The installer will select a kernel, and copy it to your new A/UX 2.0 system. 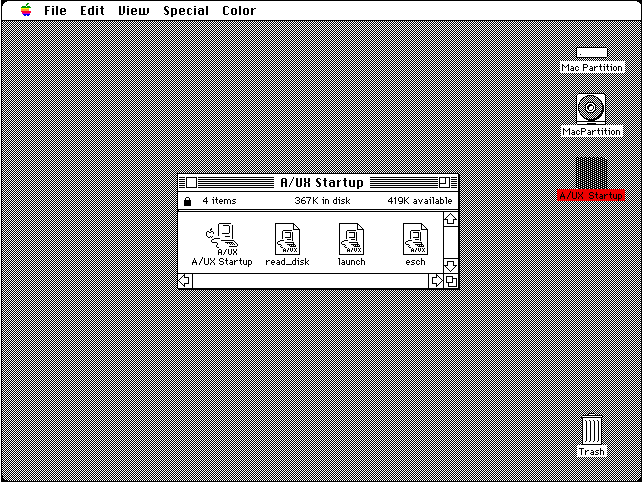 Close the "Read_Disk" program, and double-click the "A/UX Startup" utility. This will launch stage #2 of the installation. Stage #2 loads the remaining A/UX files from the installation CD onto the hard drive... Completing the installation.